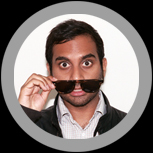 AZIZ ANSARI: POP UP SHOWS"
if you've won two tickets ($20 each) and you can text back to confirm. * Sorry I do the lotteries so everyone has a fair chance for tickets and it's not just people who are hyper active on Twitter and see a link in 2 seconds who ever get tickets. ** We won't ever text you again if you don't want us to.